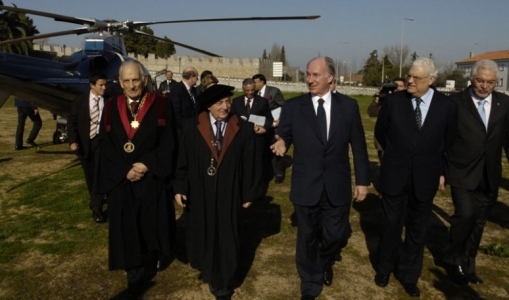 Speech by His Highness the Aga Khan at the Evora University Symposium | Ismaili.NET - Heritage F.I.E.L.D. Some of these disruptions come from new technologies—from internet blogs to biogenetics. Others spring from nature—from changing weather patterns or mutating viruses. Still others arise from social transformations—new patterns of family life, --and enormous migrations of people. Newspaper headlines remind us daily of growing strains and stresses: Civil disorder in places as affluent as France and Australia; the plight of hurricane victims in Louisiana and earthquake victims in Kashmir; the uses of nuclear energy; the sense of impotence amid suffering in places like Darfur. The planet becomes more crowded and its resources less abundant. The gap widens between rich and poor. People everywhere cry out against these evils. But change, when it comes at all, is painfully slow, and we sometimes seem to be sliding backward. I should also mention here the headlines of this past week—which chart the widening gulf between Islamic and Western societies. Here the culprit has not been military action or diplomatic failure but the power of media images----deeply offensive caricatures -- which have profoundly offended one billion four hundred million Muslims around the world— including myself. The question I ask—as I read all these headlines—is this: Why are political and civil leaders, in rich and poor nations alike, unable to develop the vision and harness the will to confront such challenges more effectively? What makes this sense of impasse especially disturbing is that it so often represents a failure of democracy. For many centuries, it was the conviction of enlightened people that societies would truly come to grips with their problems once they became democratic. The great barrier to progress, they said, was that governments listened to the special few— rather than the voice of the many. If we could only advance the march of democracy, they argued, then a progressive agenda would inevitably fall into place. But I am not sure that such an analysis holds up any longer. For the past half century, we have seen great waves of ostensibly democratic reform—from the fading of colonialism in mid-century to the fall of the Iron Curtain. But despite this apparent progress, the results have often been disappointing. Frequently, democratic failures grow out of sheer incompetence. Publics are asked to vote on issues that bewilder them. Candidates obscure their own views and distort their opponents’ positions. Journalists transmit superficial rhetoric and slight underlying realities. People are appointed to jobs they cannot do—but are rarely held accountable. Corruption for some becomes a way of life. Meanwhile, the Media tell audiences what they want to know rather than what they ought to know. And what too many people want today is not to be informed-- but to be entertained. The breakdowns are institutional as well as personal. Democratic systems veer between too many checks and balances-- and too few. Parliaments, in particular, often lack the expertise and structure to grapple with complex problems—and they are often too factionalized or too subservient to sustain a coherent view. For all these reasons, democracies often make bad decisions. And when democracies are ineffective, disenchanted publics are tempted in other directions. Latin America is one place where democracy was thought to be expanding in recent years. Yet the UN Development Program reports that 55 percent of those surveyed in 18 Latin American countries would support authoritarian rule if it brought economic progress. The challenge of democratic competence, then, is a central problem of our time. Meeting that challenge must be one of our central callings. Peoples mix and mingle, side by side, to an extent that was once unimaginable. Waves of migration indelibly change the rhythms, colours and flavours of their host communities. Some 150 million legal immigrants live outside their country of birth, joined by uncounted millions who have immigrated illegally. These trends will continue. Globalization has dissolved the tight bond between community and geography. Economic opportunity—for rich and poor alike—can lie in distant lands. Some 45 million young people enter the job market in the developing world each year--but there are not enough jobs at home for all of them. Meanwhile war and civil conflict add their refugees to the mix. Immigration brings both blessings and problems. Immigrants now account for two thirds of the population growth in the 30 member countries of the OECD, where an aging workforce requires new young workers. Meanwhile, remittances sent home by immigrants total some $145 billion a year—and generate nearly $300 billion in economic activity— more than is provided either by Foreign Development Aid or Foreign Direct Investment. At the same time, immigrant communities can sharply strain public and private resources. The resulting competition with older residents can cause resentment and hostility. More than half of the respondents in various European opinion polls have a negative view of immigration. The so-called “Clash of Civilizations” is both a local and a global danger. But it need not be this way. Nor has it always been this way down through the sweep of history. Yes-- cultural clash has been one major theme in the human story. But so has inter-cultural cooperation. This country and this university know from your own history how Islamic and Christian cultures met in this part of the world many centuries ago—and how enriching their interactions were for both traditions. This is a good time and place to emphasize the manifold blessings that come when peoples decide to stop shouting at one another, and instead begin listening and learning. Cross cultural interaction has been a central focus of my own activities in the nearly 50 years since I became Imam of the Shia Ismaili Muslims. The ethics of Islam bridge faith and society, so my responsibilities as spiritual leader are accompanied by a strong engagement in issues of community well being. The Ismailis are themselves a culturally-diverse community. They live -- as minorities -- in more than twenty-five countries, primarily in the developing world, but also in Europe – including Portugal -- and North America. This Ismaili multi-cultural experience is reflected in the approach of the Aga Khan Development Network —working with a wide array of partners to help the disadvantaged, regardless of their origin. We are pleased, for example, that our work in Portugal has recently been formalized in cooperative agreements with both the Portugese Government and the Patriarchate of Lisbon. In honoring me today, you honor the tradition which I represent, and, in doing so, you are renewing an inspiring story of intercultural affection and intercultural respect, of mutual dependence and mutual reinforcement. This brings me to my central question. What is it we can now do to nurture healthy and competent democracies, in old settings where democracy has grown weary and in new settings where it is freshly planted? I would make three suggestions—each of which is reflected in the experience of this university. By civil society I mean an array of institutions which operate on a private, voluntary basis —but which are driven by public motivations. They include institutions dedicated to education, to culture, to science and research. They include commercial, labor, professional and ethnic associations, as well as entities devoted to maintaining health, protectiing the environment, and curing disease. Religious institutions are central to civil society—and so are institutions of the media. Sometimes, in our preoccupation with government and politics, we neglect the importance of civil institutions. I am not suggesting we ignore politics—but I am suggesting that we think beyond our political preoccupations. A thriving civil sector is essential in renewing the promise of democracy. The second democratic pillar I would mention is education—rigorous, responsible and relevant education. We must do a better job of training leaders and shaping institutions to meet more demanding tests of competence and higher standards of excellence. This means moving beyond the notion that better education simply means broader schooling — wider access to formal learning. We must accompany our concern for quantity with a heightened concern for quality. Are the curricula we teach relevant to the knotty problems of the future? Or are we still providing a twentieth century education for twenty-first century leaders? Our system of Aga Khan Universities and Aga Khan Academies are addressing such questions as they work to advance the concept of meritocracy in the developing world and to maintain world class standards which will stretch our students rather than patronizing them. For too long some of our schools have taught too many subjects as subsets of dogmatic commitments. Economic insights, for example, were treated as ideological choices—rather than as exercises in scientific problem solving. Too often, education made our students less flexible—confident to the point of arrogance that they now had all the answers—rather than more flexible—humble in their life-long openness to new questions and new responses. In this light, perhaps, the controversy can be described less as a clash of civilizations and more as a clash of ignorance. The alternative explanation would be that the offense was intended—in which case we would be confronted with evil of a different sort. But even to attribute the problem to ignorance is in no way to minimize its importance. In a pluralistic world, the consequences of ignorance can be profoundly damaging. Perhaps, too, it is ignorance which has allowed so many participants in this discussion to confuse liberty with license –implying that the sheer absence of restraint on human impulse can constitute a sufficient moral framework. This is not to say that governments should censor offensive speech. Nor does the answer lie in violent words or violent actions. But I am suggesting that freedom of expression is an incomplete value unless it is used honorably, and that the obligations of citizenship in any society should include a commitment to informed and responsible expression. If we can commit ourselves, on all sides, to that objective, then the current crisis could become an educational opportunity—an occasion for enhanced awareness and broadened perspectives. Ignorance, arrogance, insensitivity—these attitudes rank high among the great public enemies of our time. And the educational enterprise, at its best, can be an effective antidote to all of them. Let me move, then, to my third suggestion for strengthening democracy in a pluralistic world —the renewal of ethical commitment. Democratic processes are presumably about the sharing of power, broadening the number who help shape social decisions. But that sharing--in and of itself-- means little apart from the purposes for which power is finally used. To speak of end purposes, in turn, is to enter the realm of ethics. What are our ultimate goals? Whose interests do we seek to serve? How, in an increasingly cynical time, can we inspire people to a new set of aspirations—reaching beyond rampant materialism, the new relativism, self-serving individualism, and resurgent tribalism. The search for justice and security, the struggle for equality of opportunity, the quest for tolerance and harmony, the pursuit of human dignity—these are moral imperatives which we must work and think about on a daily basis. In the ethical realm—as in the educational realm—one of the great stumbling blocks is arrogance. Even the resurgence of religious feeling—which should be such a positive force--can become a negative influence when it turns into self-righteousness. All of the world’s great religions warn against this excess—yet in the name of those same religions too many are tempted to play God themselves—rather than recognising their humility before the Divine. A central element in a truly religious outlook, it seems to me, is the quality of personal humility—a recognition that strive as we might, we will still fall short of our ideals, that climb as we might, there will still be unexplored and mysterious peaks above us. It means recognizing our own creaturehood—and thus our human limitations. In that recognition, it seems to me, lies our best protection against false prophecies and divisive dogmatism. A deepening sense of spiritual commitment—and the ethical framework that goes with it--will be a central requirement if we are to find our way through the minefields and the quick sands of modern life. A strengthening of religious institutions should be a vital part of this process. To be sure, freedom of religion is a critical value in a pluralistic society. But if freedom of religion deteriorates into freedom from religion—then societies will find themselves lost in a bleak and unpromising landscape—with no compass, no roadmap and no sense of ultimate direction. What I am calling for, in sum, is an ethical sensibility which can be shared across denominational lines and which can foster a universal moral outlook. In conclusion, then, I would ask you think with me about these three requirements: a new emphasis on civil institutions, a more rigorous concern for educational excellence, and a renewed commitment to ethical standards. For these are all ways in which we can encourage a climate of positive pluralism in our world—and thus help meet the current crisis of democracy. For only in such a climate will we come to see our differences as sources of enrichment rather than sources of division. And only in such a climate can we come to see “the other” not as a curse or a threat, but as an opportunity and a blessing-- whether “the other” lives across the street-- or across the world.